Cumbria is a large county in North West England and contains the Lake District and Lake District National Park. It is bounded to the north by the Scottish Borders, Dumfries and Galloway, to the west by the Irish Sea, to the south by Lancashire, to the south east by North Yorkshire, and to the east by County Durham and Northumberland. Cumbria is very mountainous containing every peak in England over 3,000ft above sea level with Scafell Pike being the highest at 3,209ft. Cumbria is also one of England’s most outstanding areas of natural beauty attracting mountain climbers, hikers and walkers, cyclists, runners and tourists from all over the world and holds a source of inspiration for artists, writers and musicians. Cumbria consists of six districts Eden, Carlisle, Allerdale, Copeland, South Lakeland and Barrow-in-Furness. The Eden district in central Cumbria begins at Durham county border and covers an area from Hesket and Ainstable in the north to Tebay, Ravenstonedale and Mallerstang in the south and westward it takes in Patterdale, Threlkeld, Mungrisdale and Castle Sowerby. Part of the Lake District National Park also comes within Eden district. The Eden Valley is a much quieter area of Cumbria with its traditional towns and pubs, beautiful hamlets and sandstone villages some dating back to Viking times, lush green countryside and dramatic landscapes. The valley is unspoiled by industry and lies between the Lake District to the west and the Pennines to the east and the Howgill Fells to the south. Eden is excellent for walking and cycling with many paths to choose from. The Settle to Carlisle railway runs through the valley and occasionally steam trains can be seen on this line. Also the 90 mile long River Eden meanders through the valley with its source at Mallerstang in the Pennines near the North Yorkshire border to the Solway Firth at Carlisle. The River Eden is one of only a few rivers that flow northwards and along with many tranquil riverside walks it is one of the finest salmon and trout fishing rivers in the north of England. The Settle to Carlisle railway line runs close to the river and the station and branch line to the Long Meg Mine were both closed in the 1970’s. The disused platforms still remain and the station building is now a private house. Little Salkeld is a small village just a few miles north of the historic town of Penrith which is often referred to as the gateway to the Northern Lakes and is the main town in the Eden Valley with many traditional pubs and shops. The manor in Little Salkeld, confirmed by King Edward I, is said to be the original home of the Salkeld family of landowners and Salkeld Hall built in the 16 century is the largest house in the village. There is a vicarage in the village but has no church. Little Salkeld Watermill was built in 1745 and is still a working mill to this day. The mill specialises in organic and biodynamic stoneground wheat, rye, barley and spelt flours milled from British grain they are also suppliers, packers and distributors of organic oats and cereal products available in specialist shops throughout the UK. There are regular tours of the working mill and there are courses in bread making and baking for adults and children. There is a gallery, mill shop and bakery and a tearoom offering morning coffee, vegetarian lunches and afternoon teas, everything is freshly home made on the premises. The Coast to Coast cycle route passes through the village. Lacy’s Caves are series of five chambers carved out of the red sandstone cliff above the River Eden. They were carved out by hand in the 18th century and named after Lieutenant-Colonel Samuel Lacy who commissioned their carving and lived in Salkeld Hall. He was once famous for trying to blow up the stones of Long Meg. The caves were used by Lacy for entertaining guests and the area was originally planted with laburnums and rhododendrons. 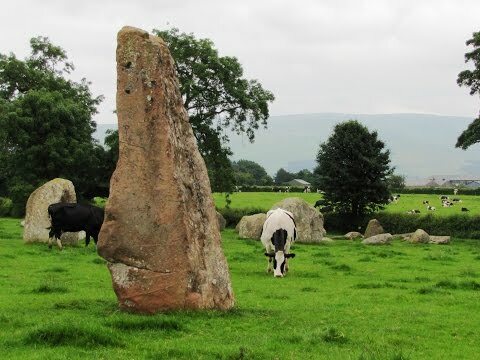 Long Meg and Her Daughters, also Known as Maughanby Circle, is a Bronze Age stone circle consisting of 51 stones (of which 27 remain upright) originally there may have been as many as 70 stones. The circle has a diameter of about 350ft and Long Meg is the tallest of the upright stones at more than 12ft high. The four corners of Long Meg face the points of the compass and mysteriously marked with three examples of megalithic art. We park at the side of the road in Little Salkeld and walk past the grass triangle and bear to the right at the no-through sign. We walk past the houses and a farm and then just before the Settle to Carlisle railway line we turn right following the footpath sign for Lacy’s Caves and Daleraven Bridge. We keep heading forwards on the concrete path with the railway line and the River Eden on our left until the lane becomes a narrow track. We follow the track with a footpath sign, passing a sculpture on the ground on the left and then two buildings on our right. After about 100yds past the buildings we turn left at the sign post for Daleraven Bridge. We walk downhill slightly passing a power substation on the left and at a barrier with a red circle on it we turn left on the footpath going back on ourselves sign posted Daleraven Bridge after a short way the path turns back on its self again and the river is now back on our left. We head forwards through the disused mine workings of Longmeg Mine and the river becomes close below us. We turn left at the small path, optional, which takes us down to view a small waterfall please take care if conditions are wet. We make our way back to the path and we see some more of what’s left of the old mine workings. We keep heading forwards, crossing over a bridge, until we arrive at Lacy’s Caves. We take a look in the caves taking note of the sign on the wall “path with sheer drops proceed at your own risk”. We then go back to the path and continue forwards over the top of the caves and keep following the path into an open field. We continue forwards through the field with the river down below on our left. We walk over the brow of the hill and cross over the stile we can see in front of us, taking us down to Daleraven Bridge and the road where we turn right and walk on the road uphill for about 500yds. The road turns sharp left and then immediately after a double bend we turn right through a gap towards a gate (no footpath sign) and then take the hedged footpath, between the two gates. The footpath sign is just on the right as we enter. We follow this path until we come to a t-junction and a track with a footpath sign. We turn right at the footpath sign for Long Meg into the trees and follow the path on the left of the track. We keep following the path and go through a gate and head forwards to Longmeg Farm. Keeping to the left of the farm we go through a gate and follow the farm road to Long Meg and Her Daughters Stone Circle. After a look around the stone circle we go back to the farm road and then head forwards on a lane and when the lane turns sharp left we head straight forwards on the track opposite to the road where we turn right and follow the road back to Little Salkeld. This is an easy walk on good paths, tracks and lanes. Approx 4.5 miles allow 2 hours using OS map OL5, The English Lakes North Eastern Area. Little Salkeld is near Penrith in Cumbria. From the A66 take the B6412 or from Penrith take the A686 to Langwathby then follow the small road sign posted Little Salkeld. There are no public toilets but there are toilets, a shop and tearoom at Little Salkeld Watermill. What a terrific website – we are planning a few days near Little Salkeld and have found just the walk we wanted. It was so interesting to follow the video and see the wildlife, and we loved the informative commentary. Can’t wait to get our boots on! Thank you so much and we’ll certainly be visiting your website for the other walks. We sat above the river to have a cup of tea and a sandwich. Plenty of wildlife below hope you are as lucky as we were. Take your camera and have a great day out.